Energy from solar panels is increasing in popularity because it is versatile with many benefits to people and the environment. If you install solar panels for your home you will receive numerous benefits: lower electric bills, lower carbon footprints, and potentially higher home values. But these benefits come with significant installation and maintenance costs if you want to power entirely your home by solar panels (living off grid). Powering entire your home by solar panels requires a 9kW system if you live in the US. A 9 kilowatt-hour (kWh) household system would cost around $25,000 -$35,000. Because a large solar PV system is very expensive, if you only need power from solar panels for some small appliances such as your laptops, LED lights, LCD TVs, coffee makers or RVs – a 100 watt or a 200 watt solar PV system are the good ways to go. Because I wrote another blog post about the 100 watt solar panel, today we will talk about the 200 watt solar panel, what can we do with that power and the best 200-watt solar panels you should buy. How much power can a 200-watt solar panel generate? The amount of electricity a solar panel produces depends on three main things: the solar cells technology, the efficiency of the solar cells inside, and the amount of sunlight the panel gets. 1. Solar cell technology | Polycrystalline or Monocrystalline? Polycrystalline panels use solar cells that are cut from multi faceted silicon crystals. They are less uniform in appearance than monocrystalline cells, resembling pieces of shattered glass. These are the most common solar panels on the market, being less expensive than monocrystalline silicon. They are also less efficient, though the performance gap has begun to close in recent years. Monocrystalline panels use solar cells that are cut from a piece of silicon grown from a single, uniform crystal. Monocrystalline panels are among the most efficient yet most expensive on the market. They require the highest purity silicon and have the most involved manufacturing process. In 2017, solar panels can convert almost 22% of their available energy into electrical power. This may not sound very good, but it is much better than 5 years ago. Looking back into 2012 most solar panels on people’s houses, for example, are fairly inefficient. Less than 14% of the energy that reaches them will be converted to electricity. Solar panel efficiency also depends on each manufacturer. There is a slight difference between manufacturers. 3. How much electricity does a 200W solar panel get from sunlight? Today, when you want to buy a 200 solar PV system, you will get a 200-watt solar panel kit which includes 2 of 100-watt solar panel and accessories. But solar panels don’t generate the same amount of electricity all throughout the day – in the mornings and evenings (when the sun is low in the sky) they will generate less power than in the afternoon (when the sun is shining on them directly). This is why you’ll sometimes hear ‘watts peak’ (Wp) used instead of watts when someone is talking about a solar panel’s capacity. In order to determine how much a 200-watt solar panel kit will generate in a day, you have to look at the total amount of sunshine that you can expect for the area you live in and the season that you’re in. Your panels will generate more power in summer than in winter, simply because there is more sun during the summer. You can find it easily in isolation world map. Annual averages of available sunshine for different cities (Solar Radiation). And averages of available sunshine for different seasons. 6.35 x 200W = 1.27kWh for the day. But you’ll also need to keep in mind that there are always certain inefficiencies in a system, total power produced will be slightly less than 20%-30%. Meaning that with 200 Watt solar panel and 6.35 peak sun hours, you will get around 1kWh for the day. With 1kWh of power generated from 200-watt solar panel. This is the time to estimate what you can do with that power. Which devices can be used? The first step is to determine how much power the appliances and lights you intend to run a draw. There are a couple of ways to determine this. The wattage of a UL listed/approved appliance can usually be found near the AC power cord. This may be in amps or watts. If it is in amps, a simple formula will let you convert it to watts: Volts x Amps = Watts. I have a very easy way to help you determine your appliance wattage is to use a Kill-A-Watt. This is an inexpensive device that monitors how much power your appliance uses. If you don’t have the patience for math calculations and want quick answers, this is probably the best way to go! Don’t be confused that you can plug a 1000W coffee maker directly into a 200W solar panel. I’m talking about running your appliances in using a battery bank. In this case, 200-watt solar panel charges your battery bank. And then you will have to use a power inverter to convert from 12V DC power to AC. You also can use your 200W solar panel for appliances without batteries, but this isn’t recommended. I’m not sure that you can put a 200W power inverter on a 200W solar panel. But if you want to run a 500W Deep Freezer, you would need a 2000W power inverter. If you only want to run a 75 watt light bulb and a 60 watt light bulb at the same time, an inverter rated at 300 watts is the good way to go. To get more details, read another post about how to choose best power inverter. You’ll never doubt you are getting the most out of your system with Renogy’s 200W Monocrystalline Starter Kit is designed specifically for customers new to solar. Monocrystalline photovoltaic electric solar energy panels are the most efficient way to produce energy from the sun. This increases their efficiency, and thus they are more expensive than the other versions such as polycrystalline and thin-film available. 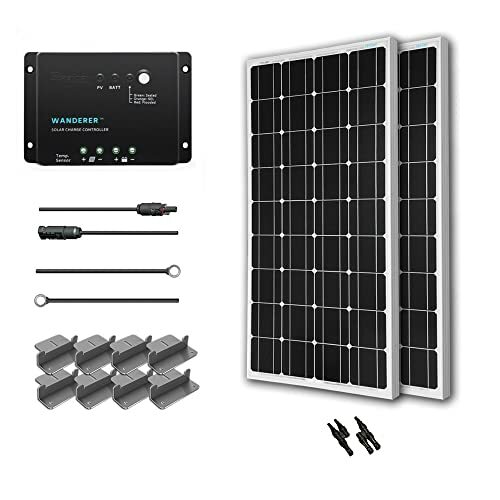 The Renogy 200 watt Solar Starter Kit consists of Two Renogy Premium Grade a High Efficiency 100 Watt Monocrystalline Solar Panels and the charge controller has been upgraded to Renogy’ s new 30A PWM Negative-Ground Charge Controller – the Renogy Wanderer. With the Renogy Wanderer 30A PWM Charge Controller, you can expand your system up to a maximum of 400W. With the ideal output at 1000Wh per day, the 200W Starter Kit is great for off-grid applications, such as RVs, trailers, boats, sheds, and cabins. It can fully charge your 50A/h deep circle 12V batteries from 50% in 1.5 hours (in case of 6 hours of peak sunlight). 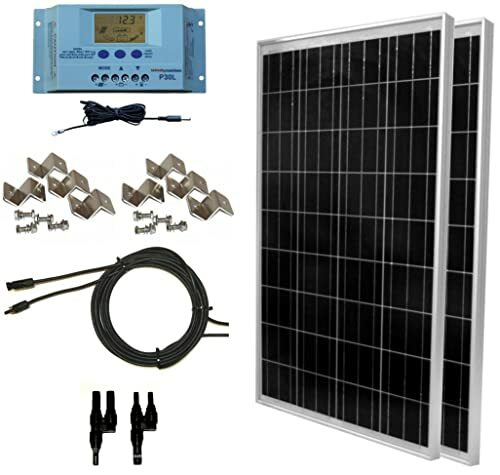 This solar kit comes with the tools necessary for a new system: two Renogy 100W 12V Monocrystalline Solar Panels, a 30A PWM Wanderer Charge Controller, a 20ft 10AWG MC4 Adaptor Kit, an 8ft 10AWG Tray Cable, a pair of branch connectors, and two sets of Z-brackets. The Renogy 200W 12V Eclipse Premium Kit uses our most efficient products to boost your off-grid system to its highest potential. This is created with efficiency and safety in mind. Equipped with the highest quality Renogy products, this fully stocked off-grid kit is ideal for various off-grid applications such as for an RV, boat, or camper. 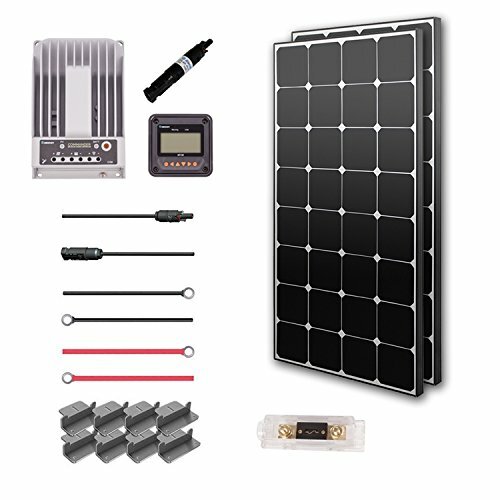 The kit includes two new 100W Eclipse Monocrystalline Solar Panel which weighs a little more than a standard Renogy panel, but in return packs a thicker tempered glass for durability. The Renogy Eclipse combines power and appeal into one sleek package. Monocrystalline panels come with high-efficiency solar cells that help increase module efficiency (18.35%). The Renogy 200W Eclipse Premium Kit includes Commander 20A MPPT Charge Controller features multi phase synchronous rectification and Maximum Power Point Tracking technologies with high tracking efficiency up to 99%. Unlike a basic PWM Controller, this charge controller is compatible with sealed lead-acid, flooded, and gel batteries (all deep cycle). The Commander keeps your batteries from becoming over-charged or over-discharged, increasing the longevity of your batteries. It also comes with Renogy MT-50 Tracer Meter for easy monitoring, allows you to keep an eye on your system. This Tracer Meter can be flush mounted on a wall or surface mounted to the ground to provide an accurate assessment of system performance. Since the Tracer Meter monitors the eight electrical parameters necessary for a healthy power system, it can also help detect a broken or faulty component so it can be remedied without causing further damage. This Tracer Meter is designed for use exclusively with the Commander Charge Controller series. It can support not only the latest communication protocols but also the standard voltage technology for solar controllers. This allows for real-time additional monitoring of operational data and the working status of the charge controller. The user can also browse and modify the controller and load control parameters. The Windy Nation 200 Watt Solar Panel Kit comes with everything you need to start producing free, clean power from the sun! This kit includes 2 pieces of 100W Polycrystalline solar panel. This is the ideal solution for providing backup power or off-grid power when you need it! The Windy Nation 200W Kit includes P30L 30A charge controller prevents the battery from being overcharged and damaged by the solar panel. It has LCD display provides system information (amperage, voltage, temperature, etc.). The digital display provides all necessary solar system information and also serves as a user interface for adjusting the charge controller’s settings. This kit will provide on average 820 Watt Hours (Wh) or 75 Amp hours of charge per day (depends on sunlight availability) and can be wired for 12V or 24V battery charging. The Komaes 200 watt solar panel kit includes 2 100W Polycrystalline solar panels with high conversion efficiency and the ideal output is 1000 watt hour per day. These 100 solar panels will automatically keep battery getting charged as long as it is exposed to the sunlight. They can be used in solar power stations, rural electrification, small home power systems, power supply for traffic, security, gas industry. It also can be used for both 12V and 24V battery charging system. 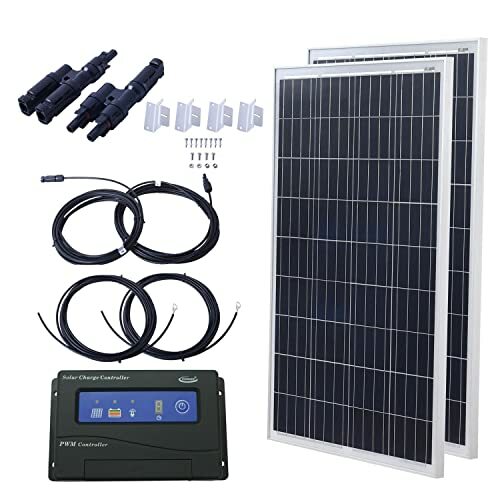 The kit includes Komaes 20A PWM Charge Controller, one pair of solar MC4 connectors, one pair 20Ft 13AWG adaptor kit MC4 solar cable + one set Z bracket.